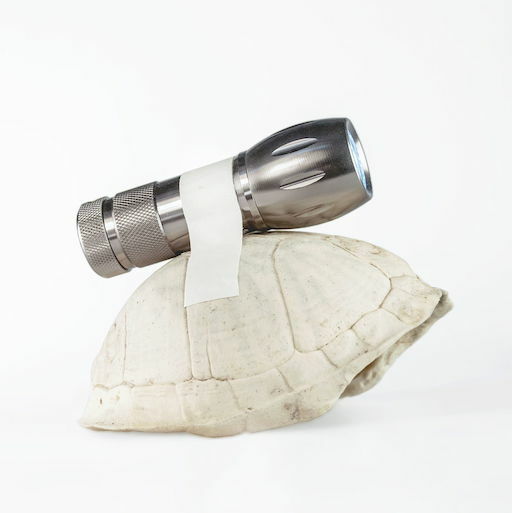 “The World to Come: Art, Politics and Climate Change” is an interdisciplinary symposium fostering dialogue around artistic experimental practices, scientific fieldwork, and anthropological research in response to the greatest planetary crisis of our era. The symposium is presented in conjunction with the exhibition "The World to Come: Art in the Age of the Anthropocene" (September 18, 2018 – March 3, 2019). 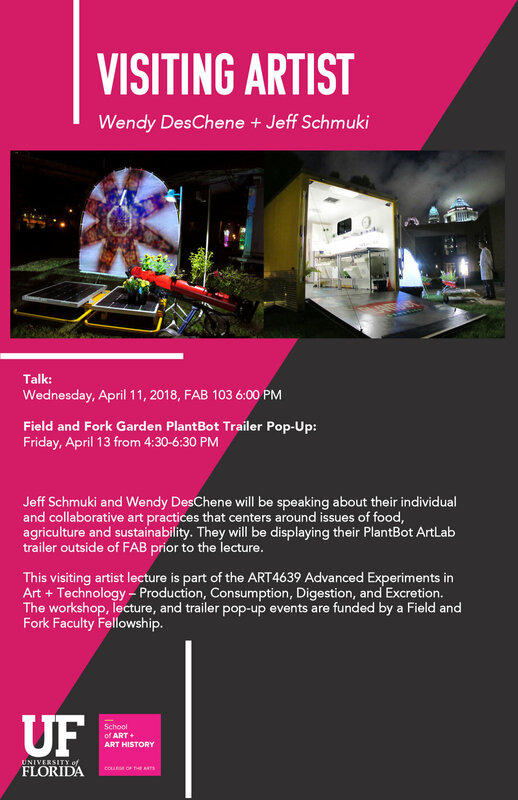 Lively conversations between guest speakers, UF faculty and attendees will confront the challenges of artistic, political and personal practice in the late Anthropocene, in search of ways forward to a more vibrant, compassionate and just future. This program is open to the public and presented by the Harn Museum of Art and UF Imagining Climate Change. Please see the full schedule + details below. "Blackout: The Necropolitics of Extraction"
This presentation addresses extraction, as well as the politics and aesthetics of emergent forms of resistance today. In view of spreading sacrifice zones given over to resource mining, abetted by exploitative international trade agreements and the finance of debt servitude, what forms do the cultural politics of resistance take, and how are artist-activists materializing the images and sounds of emancipation and decolonization? With reference to the diverse artwork of Angela Melitopoulos, Allora & Calzadilla, and Ursula Biemann, which considers geographies of conflict in such regions as Greece, Puerto Rico, and Canada and Bangladesh, this analysis addresses a range of leading artistic approaches that adopt an aesthetics of intersectionality that reveals complex causalities and effects, offers a modeling of politico-ecological interpretation, and proposes forms of solidarity with those on the frontlines of opposition. Support for the symposium is from the National Endowment for the Arts, UF Center for the Humanities and the Public Sphere (Rothman Endowment), Harn Eminent Scholar Chair in Art History Lecture Series (keynote), UF Imagining Climate Change and University of Florida Research. Visit the First Magnitude on Wednesday, September 26th from 4 to 8:30PM to meet Sean Miller and some of the artists and scientists that were involved with creating the Drifting Cabinets exhibit. 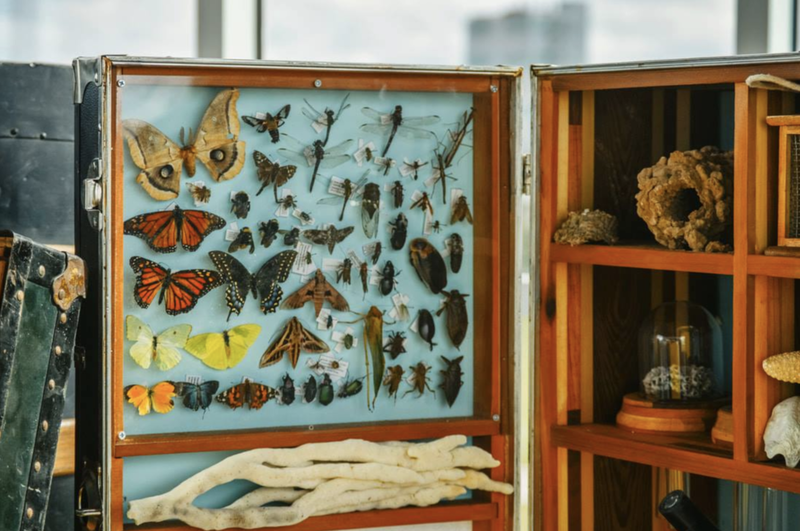 Drifting Cabinets is a portable traveling interdisciplinary art and science project showcasing Gulf of Mexico biodiversity. 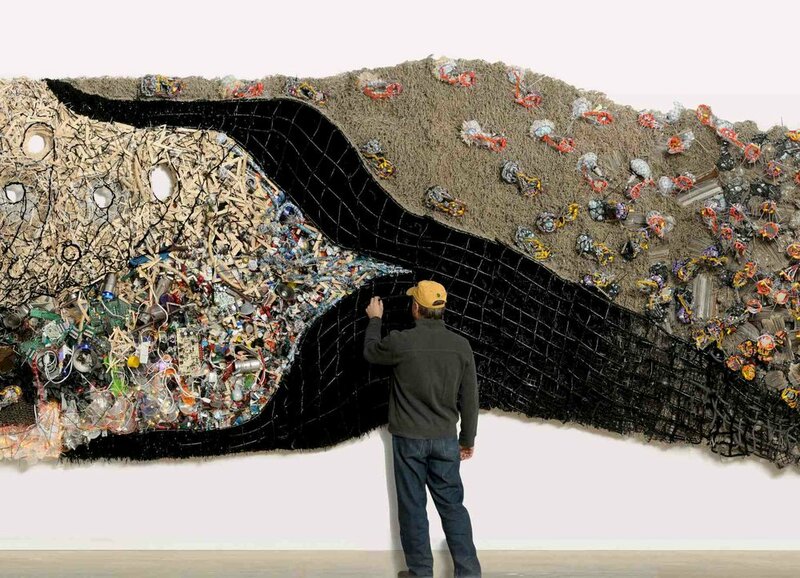 It features specimens, books, and art and displays created from recycled materials from the Gulf region. There will be musical performances by contributors Kevin Mahoney and Dan Stepp. Sean McKnight from Ashton Biological Preserve and artist Bethany Taylor will be on hand to discuss their contributions to the collection. Works by Kevin Mahoney, Sean Miller, Dan Stepp, and Bethany Taylor will be on view. Collaborating scientists on the project include: Suzanne Fredericq, Verity Mathis, Chase Pirtle, Joseph Ryan, Lisa Anne Taylor, Peter Warney, and Thomas A. Webber. Drifting Cabinets support includes: Ashton Biological Preserve, Atlantic center for the Arts, Cade Museum, University of Florida College of the Arts, Lubee Bat Conservancy, and Fine, Farkash, and Parlapiano. September 6 | 6 p.m.
September 7 | 7 - 9 p.m.
Join the University Galleries for An Evolutionary Moment | Steven Siegel from September 4 through October 26, 2018 in the University Gallery, Gary R. Libby Gallery and Grinter Gallery. \Steven Siegel is a visual artist whose work has emulated the natural world for decades. His affinity for nature is most clearly seen in the fervor for the real, raw materials. His work process parallels the evolutionary reality of life and materials. There is much physicality and presence in the objects he builds. The projects in this exhibition grew without predetermined plan or design. Visit the Cade Museum on Sunday, September 16th to meet Sean Miller and some of the scientists that were involved with creating the Drifting Cabinets exhibit. The gallery talk will take place from 3:00PM-3:30PM upstairs. Drifting Cabinets is an interdisciplinary art, science, and outreach project investigating the Gulf of Mexico biodiversity following the Deepwater Horizon oil spill. This multifaceted exhibit will be displayed at the Cade from September 1st, 2018 through September 30th, 2018. An incredibly beautiful and thought-provoking series of displays, this hands-on “collection-on-the-move” is neither static nor institutional but rather exists in a constant state-of-play, aiming to stimulate dialogue, imagination, and seeking to create ongoing interdisciplinary relationships and learning throughout the region. 3) problem solving of issues by discovering hidden resources. CoLAB Workshops will be followed by lunch. Join other CoLABers for Idea Table Cafés where we will extend the benefits of CoLAB Workshops by expanding the connections and ideas that were generated during a CoLAB Workshop. This facilitated, casual environment will stimulate new possibilities of working with each other to combine research, teaching, and other collaborative opportunities, including a proposal to the Intersections Research into Teaching Grant. CoLAB Idea Table Café sessions will be followed by a lunch or reception. To register, email humanities-center@ufl.edu. Include your name, department, date(s) you plan to attend, and your email address. Although we hope that interested scholars will attend a CoLAB Workshop and then an Idea Table Café, you are welcome to attend any and all events. These events are open to all UF faculty, staff, and students. 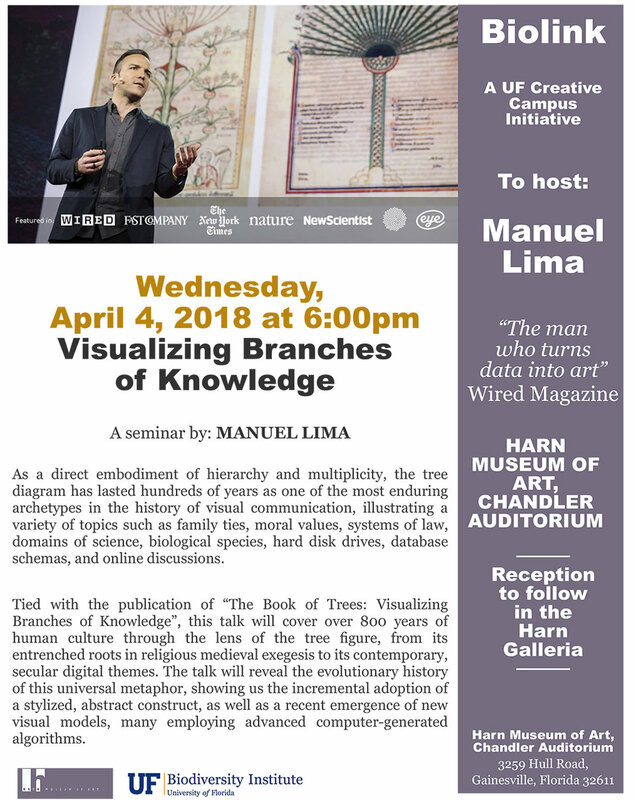 These events are sponsored by the Center for the Humanities and the Public Sphere,Intersections: Animating Conversations with the Humanities, and the George A. Smathers Libraries. Join Kristyn and Brynna Bat for an evening of botanical illustration. You will be guided from basic sketching and layout techniques through the process of creating a finished floral illustration that will be the perfect centerpiece for your holiday cards and gift giving. All supplies will be provided, no experience necessary. This is a FREE workshop thanks to the Alachua County Library! Celebrate the diversity of life on Earth as art and science collide in a series of one-of-a-kind multimedia experiences. 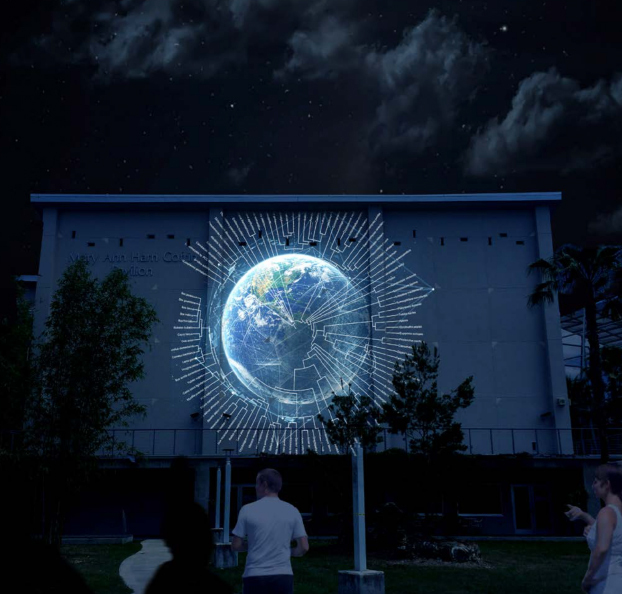 Be dazzled with an interactive outdoor light projection by internationally renowned artist Naziha Mestaoui depicting the Tree of Life, enjoy the short Pixar-style animated film "TreeTender" by James Oliverio and the UF Digital Worlds Institute and learn how biodiversity contributes to conservation, medicine, agriculture and ecology in a talk by Florida Museum biologist Doug Soltis. This event is FREE for the public. 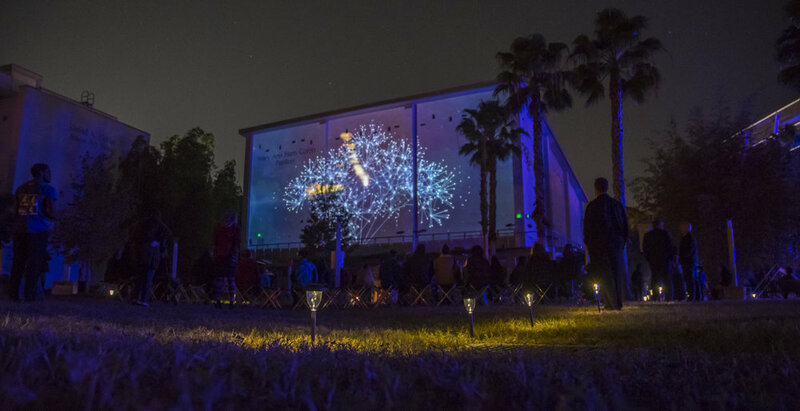 Viewing of the light projection will be ongoing throughout the event and located on the back lawn behind the Florida Museum. Viewing of the short film will be every 30 minutes starting at 7:15 p.m. inside the Florida Museum. For more information, visit www.floridamuseum.ufl.edu/onetree. Paris-based artist and architect Naziha Mestaoui is a pioneer of digital art whose multimedia exhibits question Western culture’s disconnection with the environment and re-center nature at the heart of cultural issues. Join Mestaoui for a lunch-time conversation about the intersection of art and science in Fine Arts Building C, Room 118 on November 17, 2017, 11:45 a.m. - 12:45 p.m. Drinks and cookies will be provided. This event is FREE for UF students. Seating is limited. Please RSVP atwww.eventbrite.com/e/brown-bag-lunch-and-lecture-naziha-mestaoui-tickets-38951126869. Join us for a special event as artist Naziha Mestaoui unveils Live Oak Tree of Life, her light projection of the Tree of Life displayed on live trees in Innovation Square. The event will feature live music and brief comments by Mayor Lauren Poe, UF Senior Vice President and Chief Operating Officer Charles Lane, Mestaoui, plant biologists Doug Soltis and Pam Soltis and Dean of the College of the Arts Lucinda Lavelli. Parking is available in the gated parking lot in southeast quadrant of Innovation Square accessible from SW 4th Avenue. 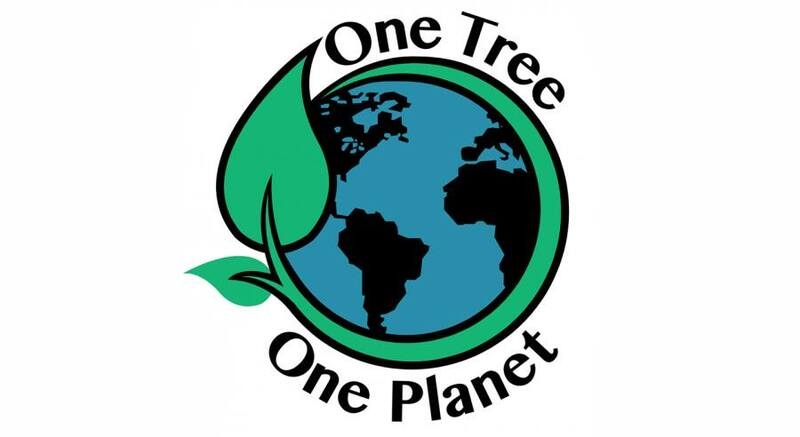 The Florida Museum and First Magnitude Brewing Company invite you to help protect biodiversity with the release of the “One Tree” beer! This limited-run pale ale will feature 11 ingredients from the many branches of the Tree of Life. During this special launch party, a $10 wristband earns the wearer discounts on all beers. Signature glasses and T-shirts will also be available for purchase. In addition, the Pop-up Museum team will be on-site with fun activities for attendees. All proceeds will directly support the University of Florida Biodiversity Institute, which explores and helps protect biodiversity at all levels, from molecules to entire ecosystems. For more information, visit www.floridamuseum.ufl.edu/event/tol-beer orwww.floridamuseum.ufl.edu/onetree. 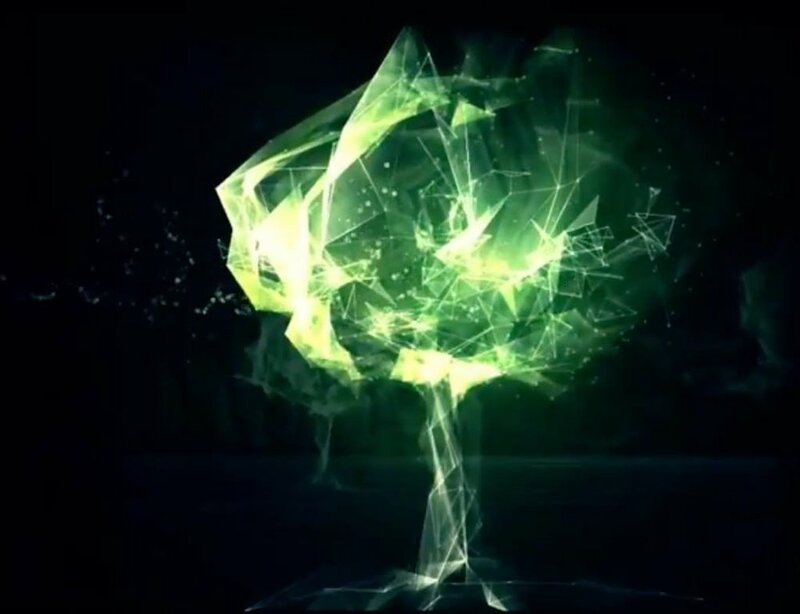 Also, visit Innovation Square from 6-7 p.m. to enjoy a special event, "Live Oak Tree of Life" as artist Naziha Mestaoui unveils her light projection of the Tree of Life displayed on live trees. For more information, visitwww.floridamuseum.ufl.edu/onetree/event/innovation-square. Public Lecture by international artist, Naziha Mestaoui, 5:30-7:00pm at the Samuel P. Harn Museum of Art - Auditorium. Naziha Mestaoui, artist and architect, lives and works in Paris. Her unique approach merges space, imagery and technological innovations of the digital era to create innovative immersive and sensory experiences. She is member of the Electronic Shadow duo, founded in 2000, now hailed as pioneers in the art of the digital age, and recognized as inventors of Video Mapping, a technique at the crossroads of spatial and imagistic art. The duo have marked their journey with numerous exhibitions across the globe: MOMA in New York, Centre Georges Pompidou in Paris, the Museum of Photography in Tokyo, the Contemporary Art Biennale in Sevilla, Sao Paulo’s SESI, Shanghai’s MOCA…. In 2011 she launched a solo artistic career, pursuing the ideas launched by Electronic Shadow and establishing herself as an artist at the cutting-edge of future-realist art. Her travels among aboriginal peoples (the Amazon, India, Oman) prompted a series of projects including One Beat One Tree, based the plurality of approaches to the Man/Nature relationship. As Philippe Descola states, this makes Western culture an anomaly given its disconnection from its environment. Today, Mestaoui is recognized as an avant-garde artist who personifies an altruistic vision of art and insists that nature be at the very heart of cultural issues. During the United Nations Climate Conference COP21, Naziha launched a digital, green and citizen artwork «1 Heart 1 Tree». A powerful and engaging experience offered citizen around the globe to see their name and message appear on the Eiffel Tower with their unique virtual tree, generated by their heartbeat. For every virtual tree a real tree is planted in a reforestation program on all five continents, destined to improve living conditions locally and fight the effects of climate change. Come out to MOCA for the last screening of "Lost Springs," a documentary film that follows artist Margaret Ross Tolbert as she experiences a collection of freshwater Florida springs normally inaccessible due to a dam. The screening will be followed by a panel discussion with artist Margret Ross Tolbert, filmmaker Matt Keene and Jacksonville University Assistant Professor of Marine Science Jeremy Stalker. The UNF Lufrano Intercultural Gallery and Museum of Contemporary Art Jacksonville (MOCA), a cultural institute of UNF, present the "Lost Springs" project through a series of exhibitions and events. UF Alumni, Kate Helms Exhibition, "RISE"
LEESBURG, Fla. -- Kate Helms, a 5th-generation Floridian, environmental scientist and artist, is presenting her latest series "Rise" at Beacon College's Kristen Michelle Mason Art Gallery in Leesburg from Nov. 1 to Dec. 8. "Rise" centers around fantasies of a luxuriously ornate home being dismantled by the climatic effects of sea level rise and tossed into the ocean, where it becomes an artificial reef for a variety of barnacle, coral and sponge-like encrustations. In contrast to widespread coral bleaching, which is causing vast swaths of coral reefs to rapidly perish into milky oblivion, these new species spontaneously evolve to thrive in the changing environment. Incorporating Victorian furniture, the show references the beginnings of the industrial era, in which humans began to substantially contribute to climate change by adding heat-trapping gases such as carbon dioxide to the atmosphere. The walls feature a variety of two-dimensional works, including altered bathymetric maps demonstrating the effects of rising sea level to coastal communities in Florida, as well as surrealistic collages. Helms is currently the Stormwater Program Administrator for the City of Largo in Florida, where she oversees stormwater pollution prevention efforts. She has previously worked on projects dealing with Everglades restoration, the BP Deepwater Horizon oil spill, oyster restoration, wetlands mitigation, and compliance and enforcement with environmental regulations as a member of the Florida Department of Environmental Protection. She has a Bachelor of Science in Environmental Science, a Bachelor of Arts in Art, and Master of Fine Arts in Sculpture from the University of Florida. Sunday, October 29, 3 p.m.
Join Professors Doug and Pam Soltis, faculty in the Florida Museum of Natural History as they discuss artist depictions of Florida species and the global importance of biodiversity in the interactive exhibition The Tree of Life. GAINESVILLE, Fla. — University of Florida students, staff and faculty have until Dec. 20 to enter the seventh Elegance of Science art competition. Organized by the Marston Science Library and Florida Museum of Natural History, the contest is open to UF students and employees who create two-dimensional images or videos as part of their research or incorporate scientific tools or concepts in their artwork. Each participant may submit a maximum of five entries, which must be high-resolution images accompanied by no more than a 150-word description on its artistic, scientific and educational value. Descriptions should be written for a non-scientific audience. Entries are scored by a panel of judges based on how well they highlight the connection between artistic and scientific perceptions of reality. Prizes include $150 for first place, $100 for second place, $50 for third place and honorable mentions. An awards reception and short presentations by contestants will take place in 2018. For more information on entering the competition, contest rules or to view past entries, visit www.floridamuseum.ufl.edu/eos. Calling all artists and designers! Bring your paper, pencils, pens, chalk, paint, pastels, clay, etc. and create a new piece of art inspired by the natural history objects featured in our newest exhibit, Rare, Beautiful & Fascinating: 100 Years @FloridaMuseum. Socialize with fellow artisans as well as enjoy a presentation on the intersection between art and science from Florida Museum Exhibit Project Manager and local artist Dale Johnson. Pre-registration is required and space is limited. Participants must be 18 years or older. Join David Biello, the science curator for TED and author of The Unnatural World, for a talk on how people’s impacts on the planet are now pervasive, profound, and permanent, like the asteroid that ended the reign of the dinosaurs. But the story doesn’t end there: He will speak about the innovators he met from all around the world and where he saw solutions to problems like climate change, pollution, and extinction emerging, even in a time that might be dubbed the Trumpocene. David Biello is the Fall Science Journalist in Residence. His recent book has received acclaim from the New York Times, Smithsonian Magazine, and other venues. More info will be posted soon. Exact dates/times T.B.A. The Smathers Library hours are Monday through Friday 8:00 a.m.-7:00 p.m. and Sunday 2:00 p.m.-10:00 p.m. The Tree of Life will address the importance of biodiversity and the interrelation of all species on Earth. The exhibition explores these themes through a selection of prints and photographs depicting Florida species, as well as a touch table with interactive and video elements. Spanning the 18th century to the present, the works on view will include engravings by John James Audubon, Mark Catesby and Pierre-Joseph Redouté, and photographs by Robert Fichter, Bea Nettles and Jerry Uelsmann. The Tree of Life is curated by Professors Doug and Pam Soltis, faculty in the Florida Museum of Natural History, with assistance from Dr. Matt Gitzendanner of the University of Florida’s Department of Biology and Annika Smith, doctoral student in Biology. The exhibition is made possible by The Dr. Madelyn M. Lockhart Endowment for Focus Exhibitions at the Harn Museum of Art.